Alex McLeish during last night's 2-0 win over Albania. Steven Naismith’s brace ensured a 2-0 win to start their Uefa Nations League campaign but McLeish had been under pressure from some quarters, after one win from his first five games and just one goal scored. 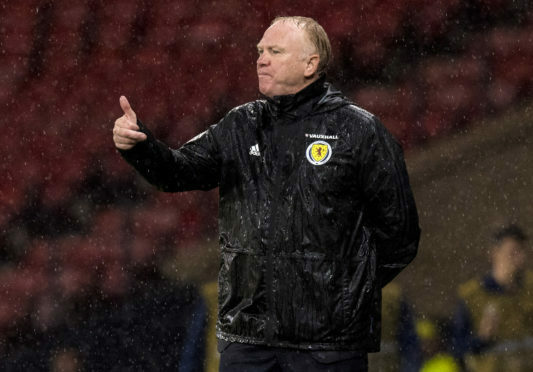 Last night’s win generates confidence within the dressing room after the disappointment of the 4-0 defeat against Belgium, however McLeish was quick to quash any notions that there is a short-term fix to Scotland’s malaise. The crowd at Hampden Park was less than the Belgium game, with 17,455 turning out on sodden night in Glasgow, as McLeish again reiterated only the national side can change the apathy around Scotland games. McLeish said: “People were talking about my win ratio being under pressure. I’m not bothered about that. I had to take the South American trip and it turned it really positive. It’s three games in a row and I’m under pressure to win a game and I know that. I’m not papering over cracks – I’m hoping to build something with these players. “I didn’t pick Belgium to fill the stadium. I did think a lot more would come to see the Eden Hazards of this world, but the only way we’ll get the fans back is by winning. I want them to come watch us – not Belgium and Portugal. That’s the goal for us. I know there’s a bit of apathy and we’re the only guys that can change that. The selection of Naismith and Johnny Russell, at the expense of Leigh Griffiths, raised some eyebrows, but on-loan Hearts forward Naismith repaid his manager’s faith with two second-half headers. Scotland go ahead of Albania on goal difference in Group C1 and McLeish wants to follow that up with victory in Haifa against Israel next month.